My little sister, Laura, was married this past weekend! 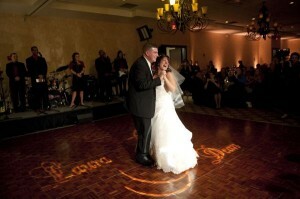 She met a wonderful man and I was thrilled to be part of their beautiful day! Assisting in the planning of a relatives wedding is somewhat different than planning for a “stranger”. When someone hires me, they look at my services as “the expert”….when your sister is planning with you, she looks at you as “the sister!” So I hope that she was happy with all the little details! The wedding took place at the Lodge at Geneva-on-the-Lake. It was a great place to have a wedding as many of our family members were able to stay for the weekend! She was surrounded by some of my favorite wedding professionals. It was very difficult for me to help her choose her vendors as I work with so many wonderful photographers, florists, videographers, bands…etc! I was able to provide her with people to look at and allow her to make her decisions! 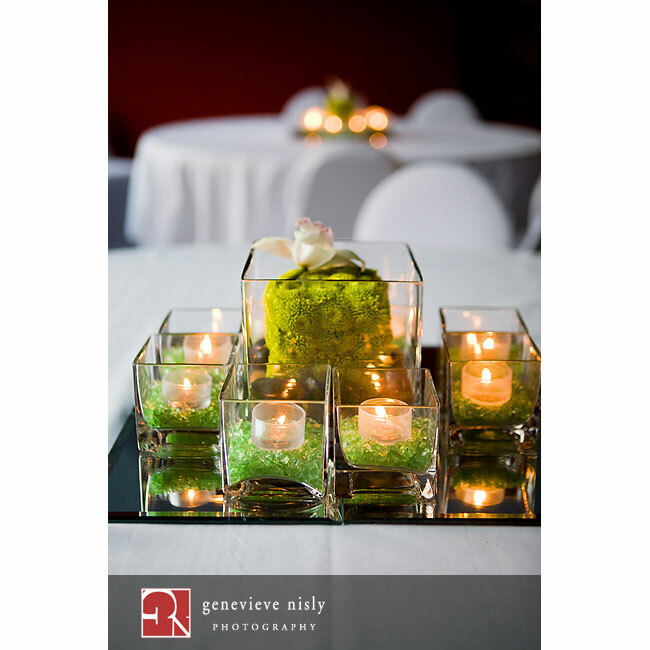 One of my newest favorite wedding professionals is Laura Woofter from Paper Allure in Canton, Ohio! She is something else! What a talented lady. She helped Laura and I design all of the paper products – from the beautiful Dupioni Black silk invitations to the blinged out placesetting chart. Lots of pictures of these gems below! She is amazing! The Decor for the day was designed by the one and only, Neil Leeson! Neil is about as talented as they come and more so, one of my very good friends! He can pull ideas out of anyone’s head and that is what he did with Laura – he helped her create the day from start to finish! 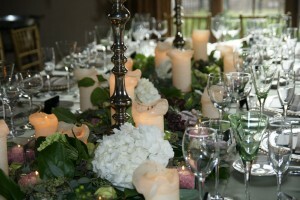 We of course had lighting from Dean at Event Lighting and beautiful linens from L’nique Linens and chair covers from Sitting Pretty Linens! The Beautiful Chargers Plates and cake plateau was from one of my favorite rental companies – Elegance by ELM….Thanks Eileen, Leslie and Magita! And what a band….we had Redline, a Jerry Bruno Productions band, and they were phenomenal. And one of the best things about Redline was they were not “too loud”….so many people commented on how they could still talk! The Bridesmaids dresses and my mom’s dresses were purchased at Abbott’s Bridal in North Canton, Ohio. What great service we received from Barb and her staff. Classy place, great selection….even worth a few extra dollars because there was not a worry to be had as there may have been at other locations! The ceremony was my favorite part of the day! I truly believe that the wedding is the most important part of the day and I wanted to help Laura create a ceremony to remember. The music was awesome! We had Mark and Kathleen Lyda as our organist and solist. They are the music directors at St. Francis Assisi Parish in Mayfield Heights and they are so talented…seriously, we have nicknamed him “Josh Groban!” We also had the Regis Bookshar Trumpet Ensemble, of Special Productions – nothing like Trumpet Voluntary with a fanfare. And we ended the ceremony with a bagpiper, Donald Willis. Laura had our Neice and Nephew do the Prayers of the Faithful – as you can see from the pictures below…this bored my neice Maggie to pieces! Since I was the Matron of Honor at the wedding….and I was also trying to make sure all the details were tended to….I decided I absolutely needed to call for reinforcement! I am the type of coordinator that is not afraid of competition…there are plenty of weddings to go around. And so I have thrilled to have become friends with with Brandi at All Events Planned! She is bubbly, outgoing, detailed and just plain “good!” I felt so relaxed on the wedding day, knowing that the details were in the hands of Brandi and my “normal” wedding assistant Laura Palmer! Thanks ladies for taking this detailed day and crossing the t’s and dotting the i’s! I started working with Davene and Andrew many, many months ago – actually about 18 months ago I believe! 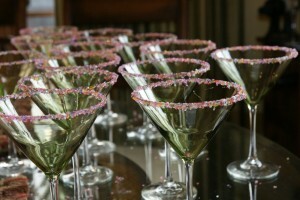 They started out desiring a very artistic, fun wedding for themselves and their guests! 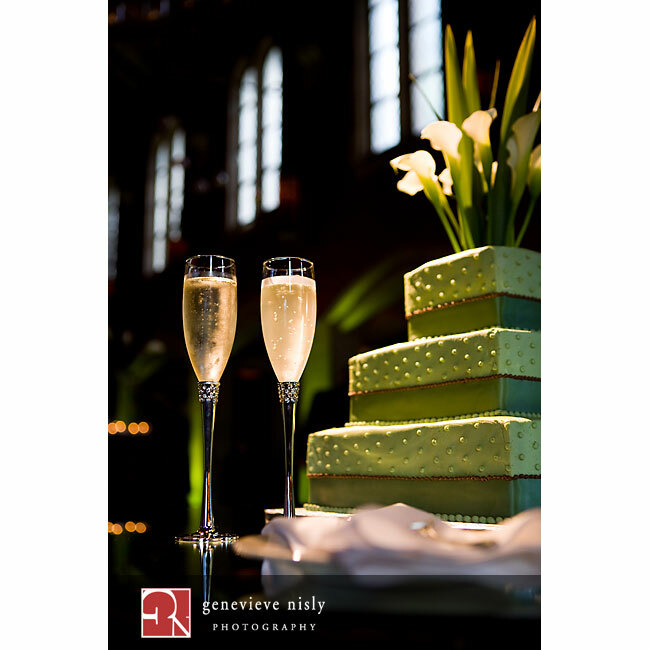 Through the months, the wedding evolved and changed many times but through all the changes, their visions stayed firm. The wedding day started with a private, intimate wedding ceremony in Boardman, Ohio. The quaint “little church” was straight out of a magazine. It reminded me of the church in Little House on the Prarie – one of my older sisters favorite shows growing up. Davene’s daughter, Sydney, is 7 years old now and she brought the entire church to tears as she placed her hand on her mommy’s hands during the final prayer. Her big smile throughout the ceremony was perfect! After the ceremony, the bride and groom had a laid back afternoon of visiting with friend and lots of pictures. Having a very early ceremony allowed for an afternoon of creative photographs. 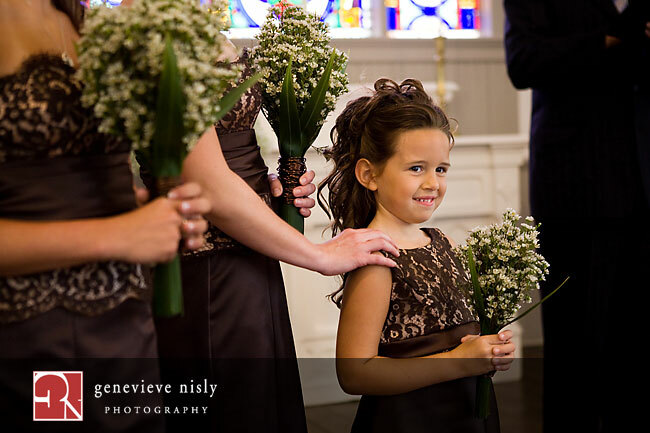 Genevieve and James Nisly were the photographers for Davene and Andrew and they are truly one of the very best! They are creative, laid back, and just fantastic photographers. 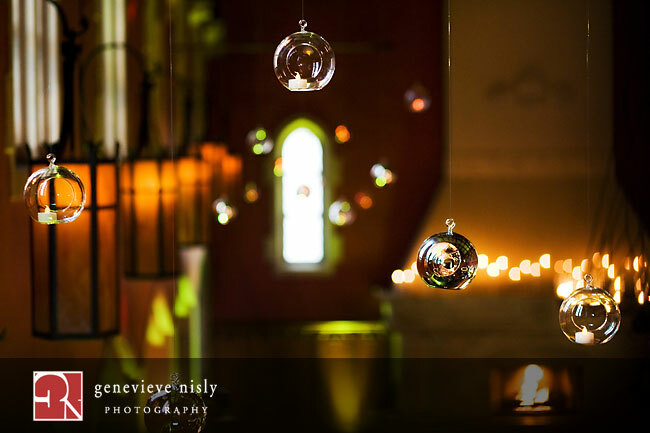 All of the photo’s in today’s blog are photo’s from Genevieve Nisly Photography! 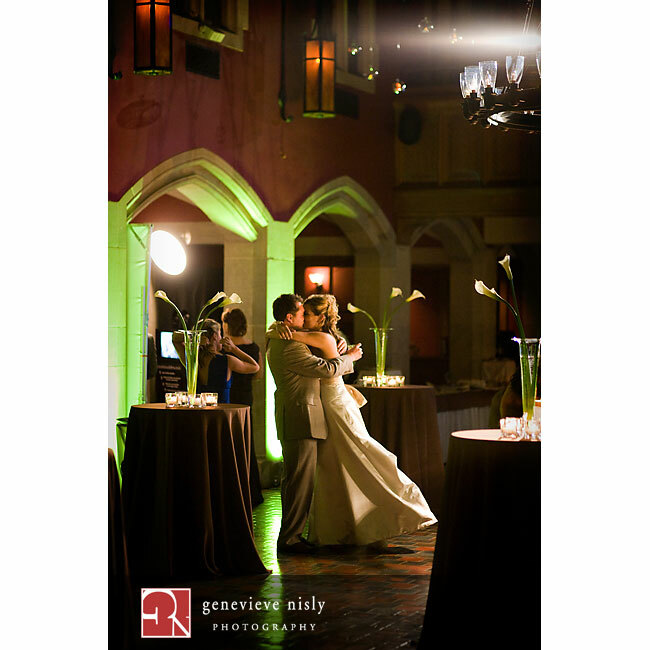 Later in the day, guests gathered at Glenmoor Country Club for an upbeat, exciting wedding reception. Glenmoor’s staff was fantastic, as usual. 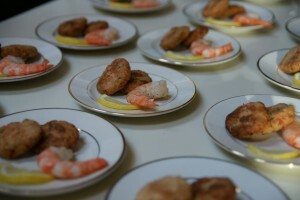 The UpEnsemble Trio entertained guests during a cocktail reception. Later in the evening, Bill Bowens with Jerry Bruno Entertainment took over the DJ position. 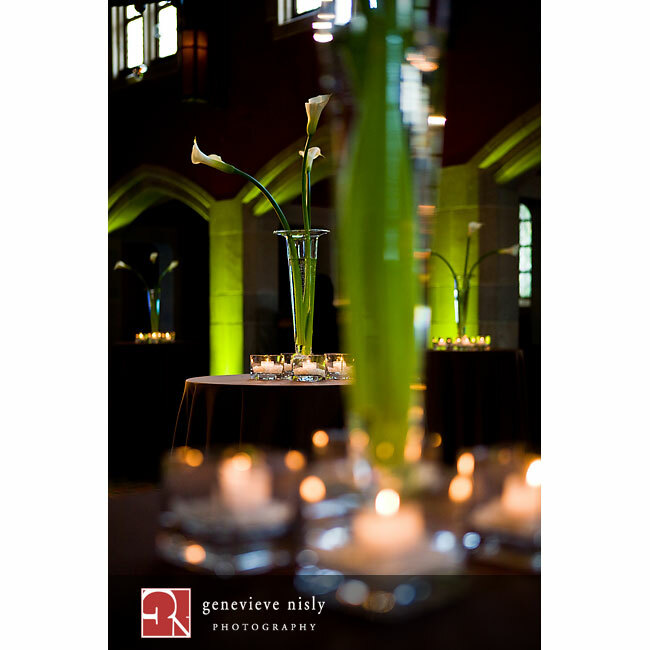 The decor for the evening was sophisticated, modern and very much the vision that the Bride and Groom carried throughout the planning stages. Flowers were designed by Neil Leeson and he is so creative and one of my absolute favorite people! The centerpiece of the room was an exagerrated vase of calla lillies – so large that it could not even fit under one of the chandeliers as it was originally planned. 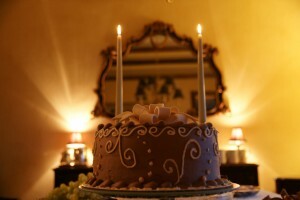 One of my favorite components that was chosen is the mirrored cake table. 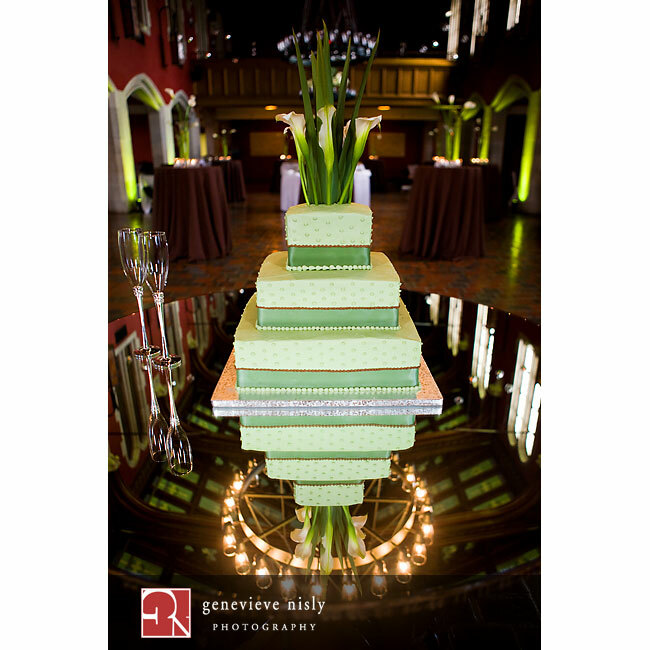 The cake was placed on top of a 60″ round mirror – what a photo it made! 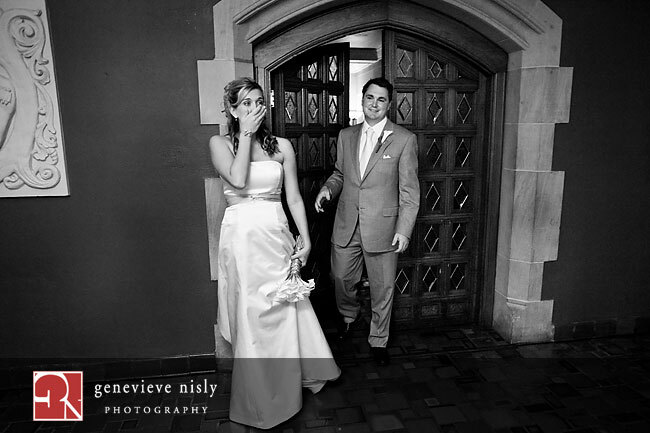 I wish Davene and Andrew all the happiness in the world – and Sydney…you were the hit of the day! 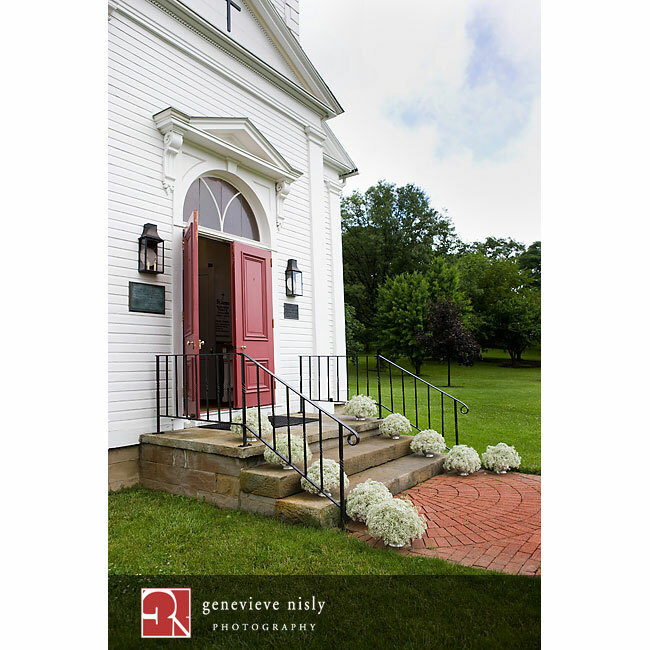 Enjoy the pictures – and if you would like to see more – visit Genevieve Nisly Photography’s Blog! Showing Davene the room for the first time - best part of the day for me! What a treat to help friends plan the day of their dreams! A little Background: I first met Bob years ago when he was my husband’s boss. Bob lived in New Jersey and would travel here frequently for work. About 3 years ago, he moved to Canton, Ohio and although my husband had moved on to another company by then, we remained in touch. Bob had a girlfriend, who also lived in New Jersey…Diana! Diana is a bundle of energy and a wealth of knowledge. We became fast friends! Diana moved to Canton and the wedding planning began! 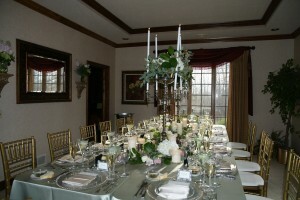 Bob and Diana wanted a small, intimate wedding for their IMMEDIATE Family only! So that is exactly what they got! 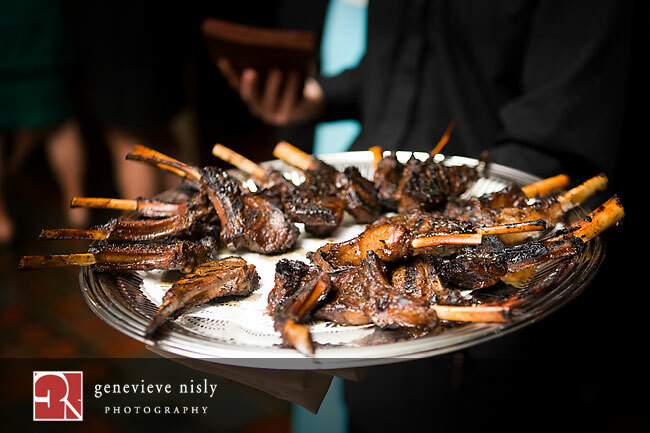 The guestlist consisted of their children and dates, and a few very close family members – 15 people in all! We planned an intimate wedding ceremony in their living room, followed by a wine tasting cocktail hour. 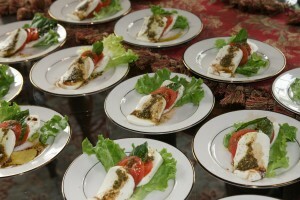 The guests then moved into a completely transformed family room for a six course meal prepared by Chef Joe Pileggi. On the menu was a shrimp Amuse, a ravioli Appetizer, Insalata Caprese, Intermezzo Sorbet, chicken and filet entree, and of course wedding cake! After dinner, the party continued with a casino night! 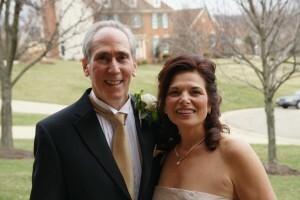 Everyone had a wonderful time and most importantly, Bob and Diana radiated with happiness! Because Bob and Diana were friends of mine, I offered to do some things that I normally don’t get my hands into – flower arrangement and photography! I had a great time taking pictures for them…but I have a whole new respect for the photographers that I hire…that is pressure! I think I captured some good shots though…here are a couple! Posted in Weddings by Tricia on April 29th, 2009 | Comments Off on Robert and Diana!